Today is potpourri day at Gadgetbox. Which is to say that it will smell fantastic , even though it kind of looks like those gourmet potato chips you see in the store sometimes. Either way, I’ve decided to go themeless for this installment, instead regaling you with a random assortment of technological goodies that I think you simply need to know about. Pursuant to that, we bring you an efficient food fryer, a handy cable management gizmo, and a motorized assault vehicle sure to strike fear into the heart of any miniature rebels you encounter. Truly, humanity’s greatest achievements have always been double-edged swords: gunpowder; nuclear weapons; the fryolator . Yes, fried foods are delicious, but their harm to your waistline is undeniable. But maybe—just maybe—a balance can be struck. Tefal’s Actifry means to stamp out some of the negative connotations associated with fried foods by frying them more efficiently. 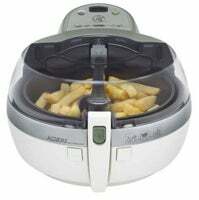 Using just a spoonful of oil, the Actifry relies instead on circulating hot air to do most of the cooking. According to Tefal, one spoonful of oil will get you an entire kilogram of fries (which, for those of you unfamiliar with the silly metric system, is only about three fries ). The result is crispy fries with a moist inside and a fat content of just 3%. Mmmm, delicious. Of course it’s not limited to fries; you can cook up veggies, meat, Mars bars, whatever your little artery-clogged heart desires. You can pick one up in the UK for the coronary-inducing price of £150 (that’s about $300). Meanwhile, US residents will have to keep the nation’s proud epidemic of obesity going strong. Laptop users get all sort of benefits that those desktop-bound fools miss out on, like the ability to pack up your workstation and cart it off to wherever you like, but there’s a darker side too. For one, the unsightly mess of cables gets shoved up on top of your desk rather than being hidden down below. Even worse, when you disconnect those cables to move your laptop, they have the annoying habit of falling back behind your desk, unless you secure them with something (my favorite tool for that task? A heavy black stapler). 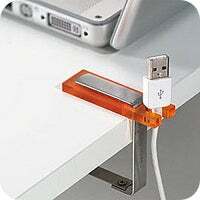 Well here’s a cheap and easy solution for dealing with that dilemma: the Knicks Cable Holder from Charles and Marie. Bizarre naming notwithstanding, it’s basically a little clamp that attaches to your desk and has a small niche in which your cable can rest comfortably, keeping its head above water the desk. All that for just $11. I’m not sure whether this can accommodate multiple cables simultaneously. But hey: if they can figure out a solution, I ought to be able to figure out a way to piggyback on it, right? Is that the pitter patter of giant mechanized feet I hear? Egad! As if mixing LEGOs and Star Wars wasn’t enough to overload the geek circuits of my brain, now they’ve motorized them? 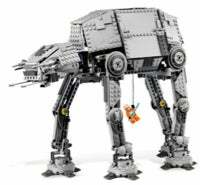 The Motorized Walking AT-AT from everybody’s favorite Danish toy company can walk both forward and— wait for it —backward, driven by the power of its 6 (not included) AA batteries. Under its mighty feet, it will crush the fleeing rebel minifigs into piles of plastic powder (well, not really; that part’s left to you and your favorite smashing implement). And if just merely plodding around isn’t enough for your All Terrain Armored Transport (oh yes, I know my Star Wars vehicles), you’ll be happy to know that it also includes an opening cockpit, rotating laser cannons, four minifigs—including fan favorite General Veers—and my undying jealousy. The AT-AT stands over 12” tall, measures more than 14” long, and is comprised of a mere 1137 easily lost pieces. For those of you with visions of Imperial Walkers dancing in your head, it’s also worth noting that this model is available exclusively from LEGO’s online store at a cost of $130. That brings an end to this delightful assortment of knicknacks and gizmos. Gadgetbox will be off next week as I take a well-needed vacation on a sun-dappled isle with no extradition treaty. See you in a fortnight.